Home Recipes Stew-ing over these 4 common mistakes! Stew-ing over these 4 common mistakes! Winter has graced us with its presence bringing some cooler weather which is the official sign from the universe that its time to pull out the long socks, woolly jumpers and of course, the slow cooker! The way we see it stews in Winter are pretty much mandatory because what is more warming and soul satisfying than coming home from the cold to a warm steaming bowl of stew? Unless its George Clooney with a bowl of warm steaming stew in his hands, then nothing really compares. 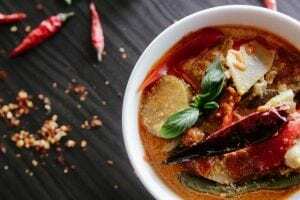 People might groan at the sight of the word stew but they are usually the ones that have had bad experiences with stews that have been left with a rather bad taste in their mouths (quite literally). Lets change that with our Mistake Busting Stew guide!So, get ready to say goodbye to dry hunks of meat, runny stews and bland mushy veg! If you are unsure of what kinds of cuts will give you the best stew, please dont hesitate to ask one of our knowledgeable butchers. They will give you their expert advice according to what kind of stew youre going to make. You can stew in peace knowing that you are in safe hands. We recommend using cuts like lamb shank, rump chunks and stewing bones. Another common mistake we often come across is people using old meats in their stew. If you arent emotionally attached to that piece we would recommend getting rid of it because if you used it in a stew, the now tight and dry meat will only become more tight and dry and wed hate for you to have unhappy stewing experiences. The rule of thumb is to cut all veggies to an equal size so that they can cook evenly. The same goes for the meat when you are dicing (making cube-like pieces) try not to chop the meat into tiny pieces as they will shrink, and youll be left with straggly chewy meat. Aim for cubes about 3-4 cms. Browning. Please, pretty please give the meat a good searing, this will boost its naturally rich flavour! Take your time with browning and dont overload the pan, give each cube space so that it can brown up nicely. This adds layers of flavour and textures to your stew. It is not a step to be skipped. The perfect stew sauce should be right between the thickness of gravy and the runniness of stock. There is a balance to be found, if you have made stew before and found it a little runny, try covering the diced meat in plain flour before browning this will help give the sauce some body. And if you are on the other end of the scale with mega thick sauce try holding out and watch as the stew develops in the early stages and try to resist the temptation to shake in flour or corn-starch to early or at all. If you are adding potatoes to the mix, let them do their job. The starch from the potatoes will help to bind the sauce naturally. Bonus!